beard voices singing "Maoz tsur"
balcony there was a "Chanukiah"
here" (outside Israel it iB"sham"
Scotland, where I was bom. in the streets and shop windows. darkening days of late autumn. capital of the Jewish people. 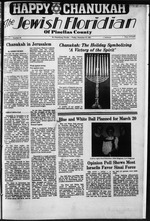 Saturday night, March 20, 1982.
year for the Jewish Community. and economic and social strata.
. pay attention to me . century BC by the Maccabees. But rather they won the. and hope oflsraefs future, will have a life of freedom and security. lence against Jews is a real fear. family member living in Israel. applies for an exit visa? may get visas in several months. POCS in the labor camps? the world will be attracted. Jewry. 210 W. 91 St.. New York. difficult time for many people. days can be extremely painful. not truly at the end of their rope. is hope for you too. weeks since the plan took effect. from about 15 percent previously. the shsrp drop in Soviet sliya. Donor has a permanent and identifiable charitable Fund. tuarial tables of the value of the remainder interest to charity. is in a lower maximum tax bracket. tax incurred on conversion of the assets. back to the donor at the end of the trust term. attributable to him when he is in a lower tax bracket. determined value of the gift to charity, but there w"*1/'* ? Trust assets because it is tax exempt! contact your tax advisor today. As eidowment *Vto. tax advisor for a confidential dfocuasfon on how to ""
will be of benefit to your Jewish Community for years to come. [Thie is written as a service to provide general *"""j"
himself out to Arab oil interests. will burn out all opposition. with single films at $2.50 each. and $1.50 for single showings. scene for a receptive and productive cash effort. have linked the two visits. the religion of their forefather. outside the walls of our office. their senators to oppose the sale. tate policy for Israel are wrong. and drug victim of tomorrow. do ha v e the thus to set as fc*. Uus point, the Program was bom. her for five to six hoars s week. cause the firms do business with Israel. modified the decree, changing its meaning. obtained blacklists to help with the boycott. have been on safe ground if he merely said ehe is "poison." offices of Arafat to gain an uneasy truce in Lebanon. have to stand in the way of a successful career. USSR is spouting anent her grounded submarine . study committee and its staff. Victor and Roe Greenberg of St.
Mr Grocer Th.scoupon is redeemable tor lb<(plus7 *<* '" j-^J"
mailed to Sunsweet5 Prune Ju.ce. P.O. Box 1404, Clinton. IA.52734. provided it has been used for a purchase in accordance with this otter. nvliw Cash value 1/201 Thisotfer expires December 31. 1982.
oihMd to one coupon per packag. SUNSWEET* GROWERS. INC.
Be off any size purchase of Sunsweef Pruifc Juice. having one. Why can't I"
can get a Jewish Christmas tree,"
father could not object to that?" asked the old man, suspiciously. "Largest Volume Osaler In Southeast"
you to eVfre tk*No.1 aaftog ear In fsraei. not a tree," he protested. "The roots lie deep in historv." showed it to his father. "That's a Chanuka Menora "
sented for them by the students. before you say the "brachot"
used room opposite the mezuzah. the people of your household. are still walking the streets. creased, so we add a candle daily. ing addressed by Mr. Bernstein. Center, 8167 Elbow Lane, St.
member $ 18 per month. Tuesday and Thursday, 4-5 p.m.
day and Thursday, 5-6 p.m.
For more information, call 344-5795.
oio is welcome. ...*=...^, *wpi SPEC. Friday, Dec. 25. from 2 to 5 p.m.
All fees include supply fee. Tuesday and Thursday, 4-6 p.m.
Monday and Thursday, 8-10 p.m.
invited to participate in JCY. Monday and Thursday, 6-8 p.m.
Monday and Thursday, 1-4 p.m.
more students at the Day School. on paper towel. Serve with sour cream or applesauce. Jerusalem to more than Israel." tired from the US Air Force. Psld By Bill Markham For U.S. Senate Campaign Committee. for only 25* a serving. shoppers look for economy and value-bargains like Wolffs Kasha. servinga true bargain in these inflationary times. Wolff's Kasha boxtop or a card with the words "Wolff's Kasha"
the Gulf Coast County Council. tee, and 74th ZOA Southwest Regional Convention. Dallas. Tex. American Jewish Congress, Executive Committee Meeting. B'nai B'rith, Board of Governors Meeting. Washington, D.C.
Monday-Friday 8 am and evening Mlnyan Tel. 381-4900, 381-4901.
ing Minyan 9 a.m. Tel. 531-1418. $2 and it is open to the public. School and College in Jerusalem. and support ORT as well. month's issue of the Floridian. tered lobby in Washington, D.C.
situation and Egypt since the as? ter on Dec. 22, at 7 p.m. at the,. [a.m. until? At 1325 S.
g at the Golda Meir Center. I they wanted to help. [the Jewish seniors of our area. needed to realize this goal. B'nai Israel. 301 59th St. No., St.
Jewish Community Center Executive Board Meeting 7 p.m..
p.m. Golda Meir Senior Friendship Club 1-4 p.m.
St. Petersburg Olan Lodge 1246- 8 p.m.
Congregation Beth Shalom Clearwater Board Meeting 8 p.m.
Congregation Beth Shalom Clearwater Mens Club 7 p.m.
Senior Friendship Club JCC Meeting Hanukah Party 1 -4 p.m.
Jewish Community Center Hanukah party 1 to 3 p.m.
Beth Chai Seminole, Sisterhood social 8 p.m.
Ahavat Shalom Dunedin Breakfast Meeting 9:30 a.m.
Senior Friendship Club 1 -4 p.m.
Israel St. Petersburg New Years Eve Party 9 p.m.
St Petersburg Meeting 7:30 p.m.
'to, to the edish d .
Hier, dean of the Wiesenthal (enter. A01. associate national director Abraham H.
< opley Plaza Hotel in Boston over the weekend. tions, and economic justice and social welfare. under the leadership of Phyllis Sutker of Skokie. Deerfiaid Beach. Fla., took part in the meeting. of all American soldiers who responded quickly to! Friends of Bar-Han University in Israel, Victor B.
grams for congregations throughout the South. versity'* f 100 million Century Campaign. recently* We recognized her daughter Lara in the front m.
apologi to si who were not invited to Tie Pep** after the wi*. Shop hours: 9 A.M. to 9 P.M.